We previously used machines made outside Japan. They have an excellent grounding feeling while running, and their operation was relatively simple. Actually, the feeling during running was similar to a track, and the base underneath the belt was made of wood, so the impact when striking the belt was soft. On the other hand, it was very troublesome that it took 6 months to a year for to fix a failure, and I could not use machines during that time. At a machine manufacturer’s booth at Tokyo Big Sight, a discussion with Ohtake Root Kogyo’s sales manager triggered creation of Ohtake treadmills. I particularly requested the ability to reproduce the running feeling of machines made outside Japan, and the ability to do fast maintenance. I first wanted to compare with overseas machines, and they created that opportunity. 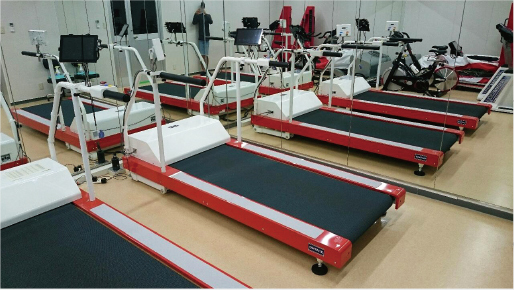 Ohtake Root Kogyo created a treadmill with a running feeling as similar as possible to that of machines made overseas. I was surprised at the speed of buying belts. After delivery, through actual training, we felt they could improve the operation panel and adjust positions of operation buttons, add operation buttons, adjust length of the handrail bars to suit female athletes, etc. They quickly responded to my requests. I was most worried about maintenance, and they handled that quickly also, so I was really satisfied. The stable running feeling including running performance is better than machines made outside Japan. We appreciate this machine that enables safe and comfortable training, as we constantly strive for world class achievements every day.